As an investor we like to check how our portfolio is doing by comparing the value growth to some index or checking the absolute growth. We smile when our rate of return is double that of the S&P500 index, and our mood is soured for the day when a months salary is “lost” on a bad day at the markets. This is counter-productive and will only lead to bad investment choices and a stressed stomach. We invest to get passive income, not a bunch of numbers that look cool on a bank statement. It’s the actual, generated cash that’ll provide a base for further investments or an income that can replace a day job, not the intra-day value of the assets. When buying dividend stocks you get two things, a stock with some value and a commitment from the company to pay you, a owner of the company, a dividend. When buying the stock the price and dividend is linked in the form of yield (yearly dividend divided by the price). But, as soon as you’ve bought it the price becomes irrelevant. The stock is now doing what you bought it for, generating cash dividends, and the price is only relevant if you’re going to sell the stock. Which you probably aren’t, because why did you buy it in the first place if that’s the case? 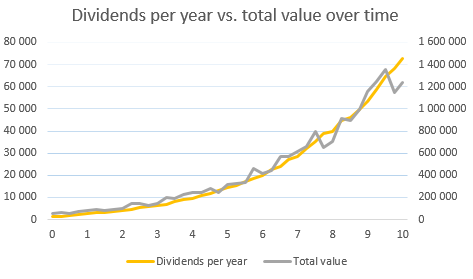 The dividends vs. total value for a dividend growth stock portfolio over time. The annual dividend of this fictional portfolio is on the left, the total value on the right. Over time the stock will rise and fall in value, but this has exactly nothing to do with how much dividends you’re receiving. The company will probably raise the dividend over time, that’s another of our entry criteria, which means that the value given to you as an owner – the dividends – will only further deviate from yield you got when you bought the stock and the yield new owners will get from buying the stock. It’s a mental challenge to buy a stock and then see the value drop of that investment. But you need to understand that when you bought the stock it was the right decision. The only time you are allowed to regret a buy, and when you also must do something about it, is when you didn’t do your due diligence and bought a company with bad fundamentals that’s going to cuts its dividend. Any other time the share price falls gives you another opportunity to invest and get even better value as an owner. The beauty of dividend reinvestment (and continuous savings) is that you every month or quarter get new funds for additional stock investments. Buying quality companies that are out of favor is what gives the best value for you as an investor. Buying on price weakness will lead to some stocks falling in price after you bought them, but this is something good that will let you make the very best investments. When the opposite happens, a stock quickly rise in price after you’ve bought it, you have two options. Just sit back and let it to what it’s supposed to do or, if it rises sharply in value and goes over fair value, you can sell it and use the profit to turbo-boost your reinvestment strategy. A 10% price increase equals three years of dividends for a stock yielding 3.3%. If you’re lucky with your entry point and get that kind of return in a month or two you might want to consider cashing in. However, this is only acceptable if there are other stocks that match your entry criteria and you don’t see yourself buying more of the company in question in the foreseeable future. Otherwise it’s trading and that’s not how to set yourself up for financial independence through passive income. The point is that as long as the fundamentals of a company is good and it continues to distribute continuously increasing dividends it’s doing exactly what you bought it for, no matter which price the underlying the market is willing to pay at a given time. Realize that the dividend rate over time is the important metric, not the paper-value of your investment portfolio, and you will sleep a lot better at night and make the right investment decisions. To read a little more about my investment strategy towards financial independence, see personal budgeting and financial goals for 2015.